Before you start you must have clean and sharp secateurs, I think Felco are the best, expensive yes but they last a life time. The pair in the photo are nearly 20 years old. At least once a year I take the secateurs apart sharpen with a wet stone or diamond sharper and replace the blade every 2-3 years. I use grease or Vaseline, better than oil between the moving parts and the spring. As I have 150 to prune, every hour or so I use fine graphite wet or dry sandpaper this is excellent for removing the muck that builds up on the blade. 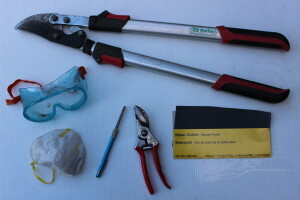 Useful medium –long pruning loppers, not in photo small pruning saw for reducing the height on very large plants. Buddleja can be very dusty, I always use a face mask and (googles on large plants) when pruning in the glass house and de-heading in the summer, better to prune when it is raining. Powdery dust can emerge which may cause coughing.